It’s been about two years since issue #5 of Brian Michael Bendis and Alex Maleev’s series Scarlet came out on Marvel’s Icon imprint. Honestly I’d forgotten about the book, so imagine my surprise when in my local comic shop yesterday I saw issue #6 on the wall with a tag that said “Last Week” beneath it. And to clarify I don’t mean surprise as a back-handed dis. Oh no. Mr. Bendis writes more than I would have ever thought humanly possible and for some of his stuff to slip between the cracks seems only natural. Look at David Lapham, another BRILLIANT creator whose creator-owned/self-published opus Stray Bullets had to go on hiatus back in 2007 while Mr. Lapham took the massive amount of work coming to him from the bigger companies in order to do what’s best for his family. I figured Scarlet was like Stray Bullets and was put on a shelf while Bendis wrote just about every major marvel book for the last few years. And it is true that Bendis talks about both he and Maleev having babies in the interim, but interestingly enough it turns out after reading the afterward in the new issue of Scarlet that domestic joy and constantly accelerating careers weren’t the only aspects of the equation. Scarlet is about a twenty-somethings girl whose boyfriend is murdered in front of her by a crooked police officer. For no reason. Likewise there is no reason (other than bearing witness) that said cop then shoots Scarlet in the head. She survives, but her life is destroyed. What’s worse is that it is destroyed for no reason – Scarlet and her friends were merely in the wrong place at the wrong time. Upon her recovery, Scarlet’s epiphany is that she does not want to live in a world where people have to endure events such as these. She decides what she has to do, does it, and inadvertently becomes the icon for a revolution. Now, that’s pretty incendiary stuff, right? It’s definitely commentary on the world around us. And things get especially real-to-life as the story unfolds, as mass gatherings of people begin to turn out in large groups to show their support for Scarlet and “occupy” public spaces in the city in order to express their frustration. 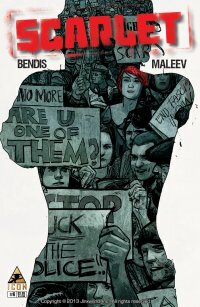 In the afterward of the new issue Mr. Bendis talks about how, in the wake of the actual Occupy Movement, events in Egypt and other parts of the world, working on Scarlet became, “uncomfortable”. This makes sense. Scarlet comes from a place that is at once very angry and at the same time very hopeful. It uses the morally gray area that keeps us stuck in the rut of a world going off the rails and it stretches and plays with that gray area. It must become difficult to write about that frustrating ambiguity when similar events are happening around you in a suddenly very hyper-real fashion, as a lot of the events in the last two years concerning freedom, violence and control have. What do you do as a writer, especially when your character does some nasty things to get her point across? A point needing to be addressed all around you? Scarlet does do some terrible things initially. She does them for good reasons, but there’s still the conundrum of ‘ends justifying the means’. Does a positive outcome make terrible deeds right or wrong? Part of the breath-taking reality of the book is that even Scarlet doesn’t have the answer to that question. At one point she says, “I needed to know that I could trade my place in Heaven for what needs to happen next.” I believe this one beautiful statement is the key to both the book and the character (thus far). So much is balanced on those words.It’s the idea of trading the things you’ve been taught are true about life (heaven, good naturally triumphs over evil, etc) for a better reality as opposed to just waiting for your reward. And you know what? It’s not easy. In fact, it’s the hardest thing in the world right now. And I need to be careful here, because I’m not out there doing anything to better the world – I’m trading my laptop and my car and my home for daily windows into the madness crouched just outside my door and an ever-expanding feeling that something has to give eventually, and when it does… what will be left? Is there hope? Honestly, I don’t know. But I’m a pessimist – it’s how I stay positive, i.e. if I think there’s no hope there MUST be hope. Is that a strange or diseased way of thinking? Maybe. But I’m digressing and this is Thee Comic Column, not Thee Pessimist’s Column. This is one of the little techniques they use to fill-in history and really streamline the reader’s relationship with Scarlet. And it works. It doesn’t feel like a short-cut, it feels like Bendis and Maleev just nailed the conceptual equivalent of a movie’s ‘montage’ segment, without the need of music that could potentially mess it up. As you can see the book really plays with the conventions of how our brains process and interact with story as presented in the graphic format, and that’s a treat. Oh, and speaking of presentation, one of the greatest things about this book (and I think all books under the Marvel Icon imprint) is THERE ARE NO ADS. That’s right – all the expectancy pleasures of reading a serialized book issue by issue, but without the ads. Oh! It is sooooo nice. So the hiatus is over. Issue #5 closed Volume #1, which is in collected format from Marvel. Issue #6 just came out last week and Bendis assures us that #7 will ship in a few weeks, so we’re going to be building some momentum again. I can’t wait! *Both Grez and I are HUGE fans of these guys when they work together – their early-oughts runs on Alias and Daredevil are AMAZING and well worth seeking out and the Moon Knight revamp they performed for Marvel about two years ago is also one of those cases where a gifted team of creators take pre-existing characters and make them their own. Yes. See my co-publisher always finds the goods. So stoked about this. And yes I still have all of those Daredevil and Alias wrapped and tucked safely away. It is of my belief that Maleev best captures Bendis. And since Bendis is becoming one of the best ever, it’s also of my belief these two will go down as one of the best tandems ever.